Buffalo-NiagaraGardening.com > Garden tips > Get professional garden design help like I did– free! 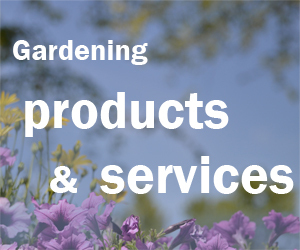 Get professional garden design help like I did– free! Before view of Cookie’s garden. We used to have a dog named Cookie who liked to sit out front and bark at pedestrians. Her favorite spot was the garden by the front porch steps. In the summer, she would dig down a bit to find some cool soil to nestle in. If it rained or even snowed, she would snuggle in a dry spot under the overhang. Even when the weather seemed unpleasant to me, Cookie liked being out there. Cookie kept the rabbits away and was an all-around loveable dog, so I relinquished this spot to her. We called it “Cookie’s Garden,” and let her do what she wanted there. 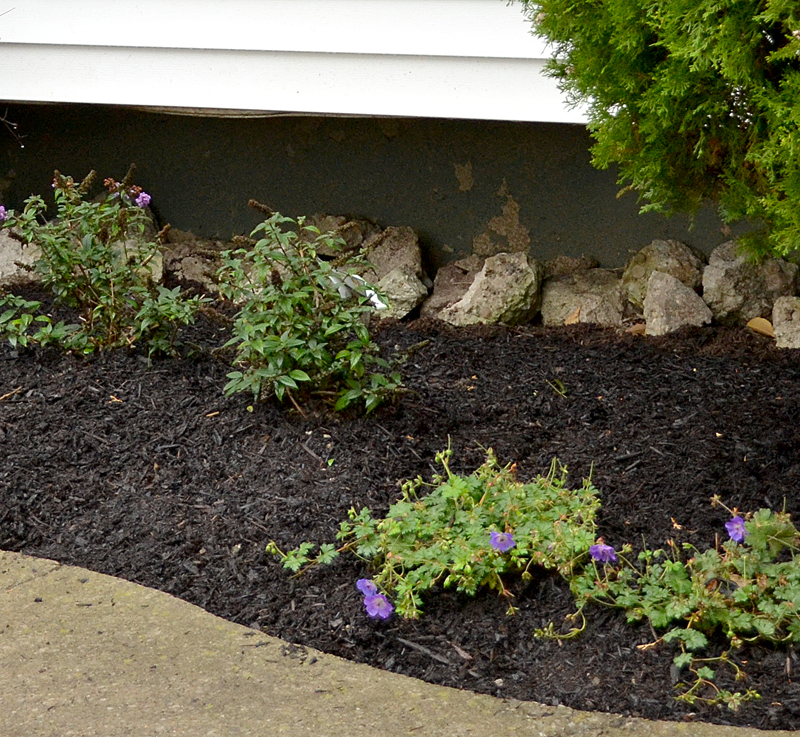 A couple years after Cookie died, I finally decided it was time to do something with that unsightly garden. Last fall I bought a burning bush and planted it the garden. However, I didn’t water it enough this summer (do as I say, not as I do!) and it was struggling. A bigger problem for that garden, though, is that it wasn’t organized. If a plant popped up, I let it grow. Forget-me-nots, vinca and a random tiger lily were scattered around. It looked unkempt. That photo at the beginning of this article shows you what a mess it was. Cookie’s garden after the makeover. Plus, I have some issues with the overhang on the house. 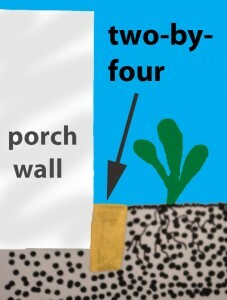 It creates a space where critters can find shelter. Now that we don’t have Cookie to keep the rabbits at bay, we have a definite rabbit problem. We’ve had rats in our suburban neighborhood, and I think they may have had a tunnel back there. (You can see the bait box in the first photo.) We’ve seen mice recently, too. 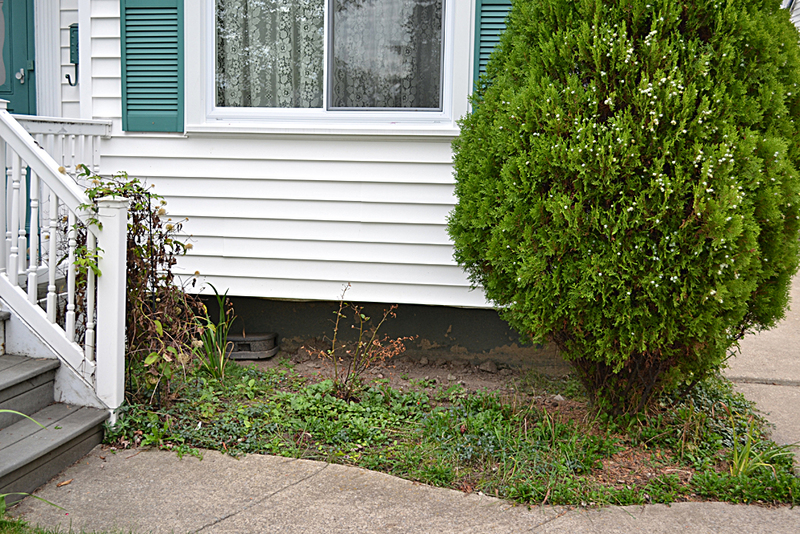 I was afraid that if I put plants in front of that overhang, it would create a very inviting spot for them. I’m a hobbyist when it comes to gardening, and part of the enjoyment I get from gardening is doing the garden design myself. But Cookie’s garden was a real conundrum. I couldn’t solve this puzzle on my own, so I went to experts and got advice for free. It’s not that I had special connections– you can do this, too! I explained my problem to Jeff Salmon, president of Arbordale. For the critter problem, he suggested that I place a two-by-four where the garden abuts the porch, burying it so that part is below the bottom of the porch. See the diagram at left. This should discourage rodents and keep them from digging under the porch. I used old bricks to fill in some gaps. He also suggested covering the garden in stone, which might make it a less desirable nesting or resting spot. That seemed like a good idea, but after some thought, I decided I preferred wood mulch. What I did instead was place chunks of broken concrete from my neighbor under the overhang. Although you don’t notice them much, they actually look pretty good there. Plus, it’s a good way to recycle broken sidewalk. That’s something I like about this process: For better or worse, this is still a garden design I can call my own. The garden might have been more spectacular if we had gotten rid of the tall arborvitae that’s there, but I wanted to keep it, so they worked with me. Amy Miller, greenhouse manager, had a good sense of the size and number and plants I would need to fill that space. I had tried to fill the space with one plant; her design included five. She also knew which plants would work in that location. She gave an example of a lace-leaf Japanese maple, which she says everyone loves, but you can’t plant it just anywhere. It needs to be placed in a spot that’s protected from the west wind. We finally decided on two butterfly bushes, which are in the middle of the garden. In the closeup photo above, they are to the left. The butterfly bushes are called Lo & Behold ‘Blue Chip’ Summer Lilac. The bushes will get larger and fill in that spot, but they won’t get as large as other butterfly bushes. It is a small variety that get only 24 to 30 inches tall and wide. To the right are three Rozanne Cranesbill geraniums. They won’t get much larger than they are. Both kinds of plants are perennials, and both still have flowers this late in the season (the Rozanne Cranesbill geraniums have more flowers now than the butterfly bushes do). These will look great in the summer, too. One plant I didn’t discuss is the clematis near the railing in the first photo. It’s a wonderful plant, even though it looks shabby. (That’s because I didn’t water it enough this summer. Miller made sure I bought some polymer crystals that retain water. I mixed them into my the soil around my new plants, and I vow to water more next year.) Anyway, I didn’t like how the clematis tangled around the railing by the steps. It made the railing useless, so I moved the clematis away from the steps. I know many of you won’t believe me, but it’s not too late in the season to redesign a garden or start a new garden. In fact, the cooler, wetter weather of fall is better for plants trying to establish themselves than the hot, dry weather of summer, which can stress plants. There are still plenty of plants to choose from at Arbordale, and they’re on sale! Perennials are buy two, get one free, Miller said. Shrubs are 25 percent off and trees are discounted, too. 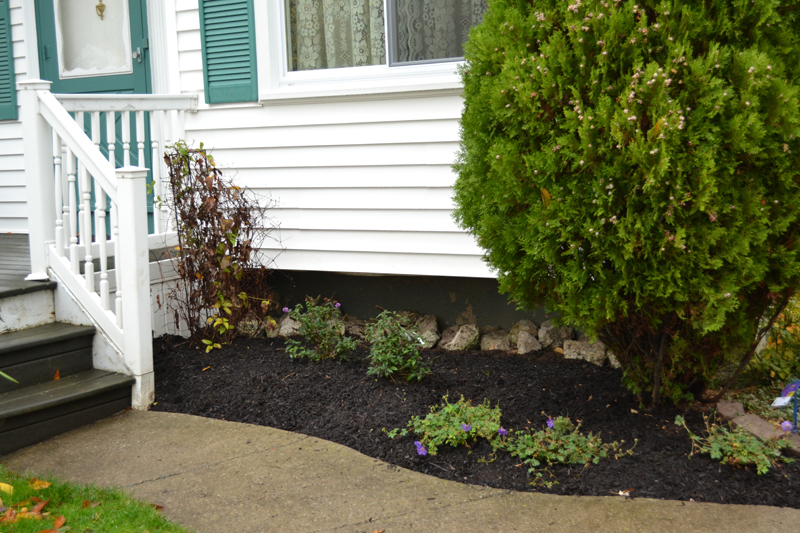 If you want a garden makeover but don’t want to do the work yourself, you can take advantage of Arbordale’s landscaping services. For an estimate, fill out the online form or call 688-9125. Looks great, Connie! And, you can’t go wrong with purple! Thanks! Garden redesign is a whole lot easier when you have somebody who knows what they’re doing guiding you along. I like the sidewalk chunks, I think it adds a different dimension and enhances the space. GREAT job! What a difference. I have the Cranesbill geraniums and they always look beautiful when they bloom. Mine have spread out and are low and bushy. I have them in the front of my garden bed. The rocks along the back of the bed also give your bed a rustic, natural look. Thanks for sharing and I enjoyed the story about your dog, Cookie! Bonnie, thanks so much. I was surprised at how much I liked those concrete chunks. That empty space under the overhang bothered me visually, and the chunks fill in the space. And thanks for your kind words about Cookie. She was a very good dog. Does anyone know, when do we trim bushes? Mine are getting a little unkept, but I don’t want to do it at the wrong time. But I am trying to make the front landscape as nice as possible. My problem is too many things growing! I’ve taken some out, but I guess I’m a plant hoarder, because I still need to do more. An article on pruning roses: Should you prune roses in fall or spring in WNY? Hint: not fall! Thanks! I just want to shape them a bit so they look nice and not overgrown for summer.